The first edition of the Smithfield Nocturne was held in June 2007 at the central London Smithfield meat market and a place of execution of ‘heretics’ in the 16th century. 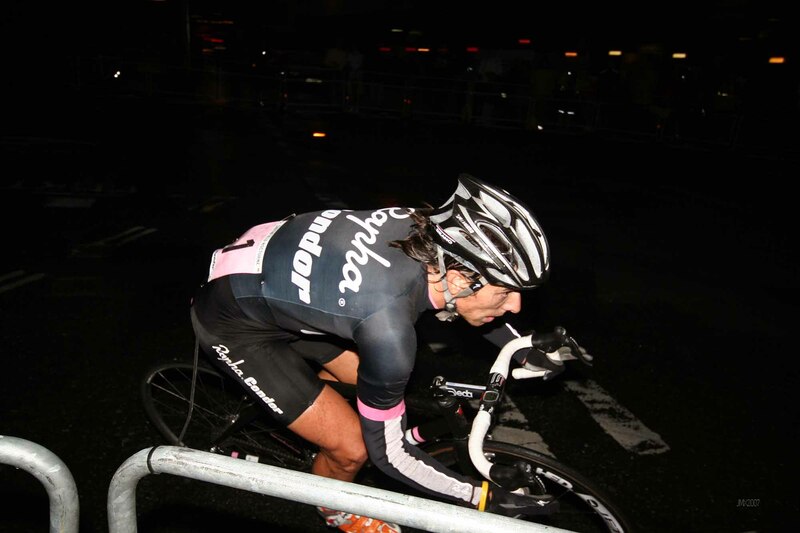 The event has now moved deeper into the City of London and has been relabelled as the ‘London Nocturne’. This event in 2007 marked for me a change in the cycling culture, no, not a change more of an evolution, of London’s cycling landscape. On that first evening of racing, promoters Face Partnership fronted by James Pope and Fran Millar (sister of David) brought together the booming single speed scene, folding bike commuters, club road racers and the UK’s top male riders. Women would have to wait until 2009 before they had a race of their own. Cultures and counter-cultures are forever springing up, and each new ‘generation’ or ‘wave’ often brings with it a new mind-set which can seem plain tiresome or even disruptive to some, or a good shot in the arm for others. That first evening of the Smithfield Nocturne was a festival of cycling that brought often uneasy alliances together to party. I recall the first Craft Beer stalls at the event, but not yet Craft Gins, which I guess had to wait for the Hipster scene to grow. It was quite a mixing pot, but because I knew so many across the London cycling spectrum this seemed quite normal to me. For others it was not so straight forward, I remember club roadies and race officials being bemused by the Brompton race and positively dismayed at the single speed criterium. ‘What are the rules?’ Is it safe? OK, the SS event was a bit hairy and one or two riders were taking a last drag of a cigarette as they lined up for the start, but otherwise, it was just another race (if exciting). That first evening began dry but then the heavens opened, the Brompton race was saturated and huge puddles filled the kerbs of the meat market, thankfully most of the different cycling clans stayed to watch the ‘big race’. This featured two of the biggest UK road squads of the time; Plowman Craven Racing Team and Rapha Condor led by James McCallum and Dean Downing respectively. Plus, there were local heroes such as Alex Dowsett, Warrick Spence, Andy Lyons, Roger Morgan, Dean Shannon and so many others. Rapha Condor were also integral backers of the Nocturne and many thought that the London cycle shop, open since 1948, and the Rapha clothing brand’s cycle club that was in the process of morphing into a professional team, plus Face Partnership – were all the same company. As I have suggested, I tended to cross barriers as I produced a cycling website that covered all aspects of cycle sport in London and the surrounding areas, therefore I was on very friendly terms with all three brands. In addition there was Guy Andrews who I knew very well and who had produced the first issue of Rouleur in 2006. Rouleur and the Smithfield Nocturne were very much part of a sense of a new era, new alliances formed as people began to realise that different cycling tribes existed in London, and that there was a hunger for cycling. I remember sitting with Grant Young of Condor, Simon Mottram of Rapha and Guy many a time back then. There was a buzz about cycling which is still growing today, there was an awareness that we were ‘standing on the shoulders of giants’, to paraphrase Sir Isaac Newton, something some forget in the consumerist world of cycling of 2018. Simon, in many ways, was the architect of and role model for many of the new ventures that seem to crop up regularly. He had a strong vision for Rapha and a message which annoyed many, but I knew from personal experience that he had strong sense of cycling heritage, he knew how cycling worked in the UK including the role that cycling clubs played, and he never under talked or under played their importance. What he knew was that he could grow his brand upon the cycle community that existed at the time and develop beyond it. Back then in 2007 PR speak was less obvious, and those proclaiming that they were going to make cycling great and create a ‘real’ cycling community spoke less urgently. For me it was simply a case of the time being right to showcase a high end spectacular show complementing the hard work being undertaken by road safety campaigners to make London streets safer for bikes, and cycle clubs that were a point of reference to newcomers and the starting point for so many, including most of our current superstar riders. James and Fran sold the Nocturne as a celebration of cycling gaining the support of many including myself and not as a revolutionary act, and that’s probably the reason it has run through to 2018. In those naive days we were as yet untouched by the sort of PR talk I have witnessed in recent times, such as “If you’re aiming to meet up with real cyclists, before 9 am, ……. is the place to be. Without taking PR and marketing too seriously, it would be nice to see more humility and a knowledge of heritage when hailing the new dawn of cycling in 2018, after all nothing is ever really new in this world. When I and others teamed up to organise the Beastway MTB Series in London in 1994, we made a point of bringing together old clubs, new clubs and teams. We made a conscious effort to step out of our new wave (then) MTB tribe, and it was we who gained – many of the people who supported us came from long, long established clubs and had never seen a MTB race, but were still up to helping with their judging expertise. They told us great tales of riding in the 50’s and the 60’s etc., showing us wonderful pictures of them riding many miles to an race event (and back) with racing wheels carried on their bikes ready to be fitted for the time trial or road race. We as organisers in turn surprised them by our appreciation and also the riders themselves who were so grateful to have them. One long term club president said he couldn’t remember when he was last thanked by a rider for putting on an event, and on this night he had been thanked almost endlessly. We had linked across the cycling tribes in a joint enterprise, which seems to be an idea that is increasingly being lost as people choose to pursue a more individualist cycling ‘bubble’ life, buying services rather than mutually contributing. My biggest memory of the first Nocturne was the rain and the noise of the cheering fans, I also remember stepping in to help to distribute photographer’s bibs when James was hurt during event preparation. In addition I stepped in to tell the judges and commissaries that the result they had produced at race end of the pro-men was not correct. The wrong race numbers had been given out. Thankfully I had taken my own notes and was able to provide the names of the top ten. I missed the 2008 edition as it clashed with the 2008 VC Roubaix – Paris Roubaix Sportive, and for subsequent editions I helped judge or commissaire races until a few years ago. The energy of cycling had been building in London and the 2007 Smithfield Nocturne was a major signal that cycling was breaking through a sporting glass ceiling and was attracting the greater interest of the mainstream press fired by Olympic track success, new clans such as Hipsters who had embraced the Courier Fixie scene were growing and cycling was on its way to becoming the ‘new golf’ for many. Meanwhile the cycling club structures kept on with business, and those who were able, such as the Dulwich Paragon turned their long heritage to their advantage in this new age. I was never much of joiner, but I do like ‘joint enterprise’ and I was a member of the original ‘green’ London Dynamos and a founder member of the London Phoenix, both of which are now very much part of London cycling scene, but back then they were upstarts. For me, the key to everything is that events shouldn’t just be a ‘one night stand’, but whether it is an event, a club or a scene, it should be about creating legacy and opening doors. I had to laugh a number of times, especially regarding cyclo cross, where people have argued that all races should be spectacular and contain gimmicky features such as tequila short-cuts etc., but these rarely last, because so many of the added frills and extras turn out to be unsustainable. If you want to keep an event going week after week, month after month and year after year – that requires more down to earth commitment. The steady commercialisation of cycling has seen ‘pop up’ events appearing, these events are often not embedded in the ‘normal’ fabric of governance or cycling activity, but are piggy backing onto the work of others; good luck to them I say, but they and you should be wary that all ‘stand on the shoulders of’ the often maligned governing bodies, traditional clubs and other organisations that underpin events. Please save us from promoters or companies who say they are going to revolutionise cycling etc. Whether it be a ‘funky ’event or product, they often cannot keep it up because at the end of the day it’s just short-lived hype without any remote hope of creating genuine legacy or sustainability for the future of cycling. 2007 Picture Gallery (all races in order) in addition to those below. I don’t have a result from the All Stars, Courier or Folding Bike races.